Love Magazine enlists five of its current favourite muses to channel Disney character Minnie Mouse for the magazine's 10th Anniversary issue. 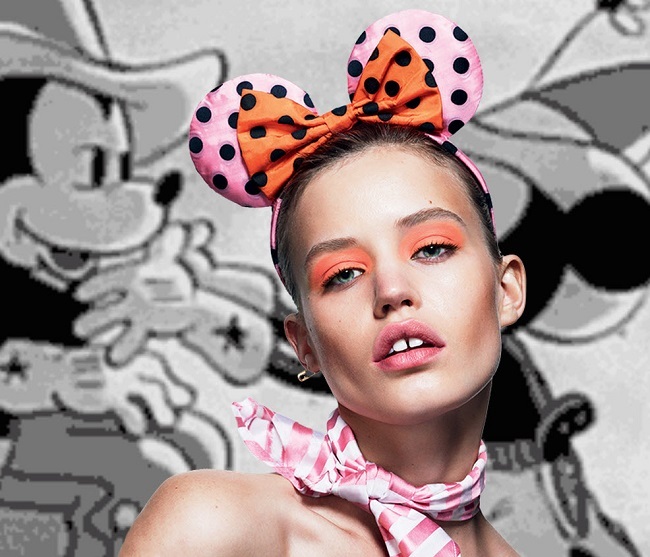 Entitled the "Sweetie Issue", Editor-in-chief Katie Grand was inspired by photographer Herb Ritts' 1987 shot of Madonna in which the iconic singer dons Minnie Mouse ears replete with a polka dot bow. "There was something about that look - knowing, but genuine, and genuinely sweet - that got me thinking. And I've always been a fan of Minnie's style and that polka-dot bow. So we set about getting my favourite girls in Minnie Mouse ears that had been enhanced by the likes of Miu Miu and Jake and Dinos Chapman for Louis Vuitton." explains Grand while speaking with Disneybymark.com. Models of the moment Cara Delevingne, Edie Campbell, Georgia May Jagger, Rosie Huntington-Whitely, and the surprise inclusion of Japanese newcomer Chiharu Okunugi round out the cast of cover models. Photographic boy wonders Mert Alas & Marcus Piggott capture the unique individual qualities of each model from Delevingne's expressive goofball antics, to Huntington-Whitely's simmering sensual allure, and Okunugi's oh so sweet demure prettiness while injecting each image with a healthy dose of good old fashioned Disney fun.